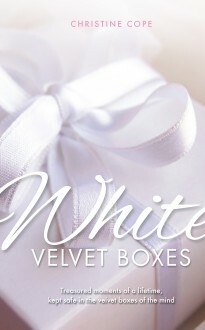 Christine Cope sees all her special memories of life as occupying rows of white velvet boxes at the back of her mind. The boxes, each tied delicately with coloured ribbon, contain happiness and sadness, humour and conflict, pleasure and pain. When she wants to remember an episode from her past, she just pulls on the ribbon. Christine believes that it’s how you deal with each memory, pleasant or painful, that determines how it will appear the next time you open it. This book is about the things Christine has saved in her boxes over the years – precious memories of childhood adventures, seaside holidays, valued friendships, secret corners in summer gardens, playground battles, her beloved dogs and her children and grandchildren. Together they have given her an insight and a wisdom which are well worth sharing with others.